Design integrity is a fundamental part of each tank container built by Welfit Oddy. The following procedure shows the standard program used by Welfit Oddy for all our designs. New concepts are developed by our engineers using the latest 3D computerised modelling packages and then interrogating these ideas with in-house Finite Element Analysis (FEA) programs. 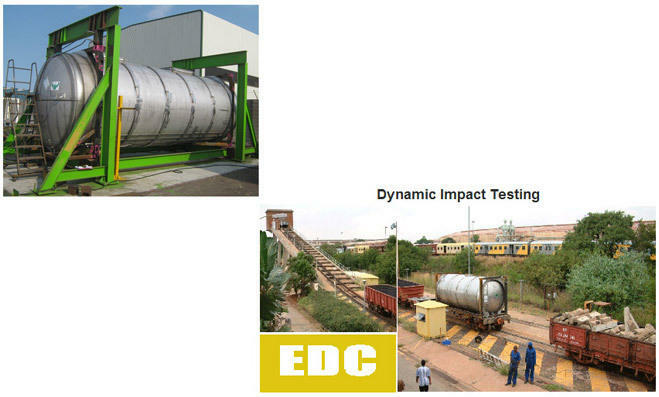 The regulations and authorities governing intermodal tank containers require each frame design to be subjected to standard static and dynamic testing. However at Welfit Oddy we consider this to only be the minimum requirements and use this as the starting point for our testing. This is conducted ‘in-house’ under 3rd party review and supervision. In order to ensure our designs are up to the task of transporting hazardous and high value liquid cargoes around the world, over a long service life, we have developed our own testing requirements which not only meet but we believe supersede the levels set by the relevant design codes. Each successful frame design is subjected to rigorous structural fatigue testing, based on ten years worth of real world data that we collected to validate the design. Structural fatigue testing is carried out using the unique Welfit Oddy Load Profile to simulate accelerated life, as well as Harmonic Analysis to detect Natural Frequencies. A prototype tank will be built and tested to destruction to ensure the design meets our expectations and requirements. We are committed to reducing our customers risk through innovation and cutting edge programming and testing to ensure design integrity throughout a long product life.